Most triathletes spend years of dedicated training to take their performance to the highest levels to earn the chance to qualify for the Ironman Triathlon World Championship in Kailua-Kona, Hawaii. The number of registered entrants -- more than 1500 who qualified, 205 lottery slots, former winners and select others -- has topped 1900 in 2010 for the first time ever. However, getting to the finish line on Alii Drive is far from guaranteed. 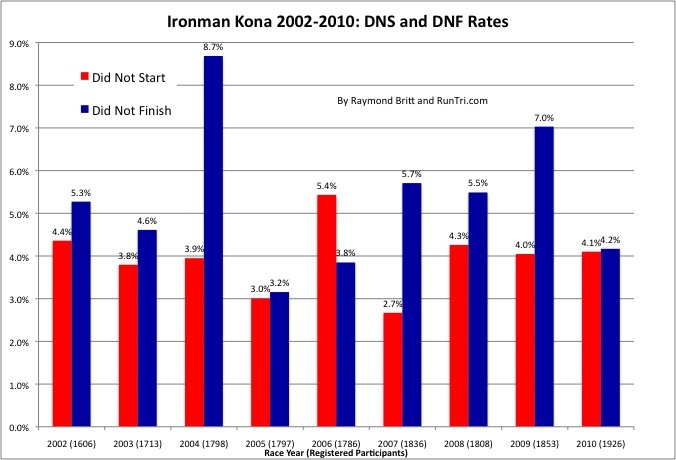 It's not uncommon for 10% of entrants, or more, to not start or not finish Ironman Kona, in any given year. Up to 5% of registered entrants may not present to start the race. Another 5% or so will start but not finish, and the DNF rate has ranged as high as 9% in 2004 and as low as 3% a year later, in 2005. Yes, Kona can be brutal one year, and, well, less brutal another. See our Kona 2002 to 2010 Swim/Bike/Run/Finish Times Analysis for examples. For more, see our complete Ironman Kona Hawaii Coverage.